PEARL LIBRARY'S BROWN BAG ENGAGING! 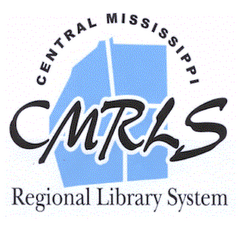 Mississippi author, Joe Lee, owner of Dogwood Press in Brandon, was the guest speaker at the Pearl Public Library's Brown Bag program on Friday. Director's Cut (2014) is Joe Lee's fifth installment of the critically acclaimed Oakdale suspense series. It is his seventh novel. "Joe Lee is a great speaker," said Eleanor. "He made me want to read all of the suspense series he's written! He really drew me in!" 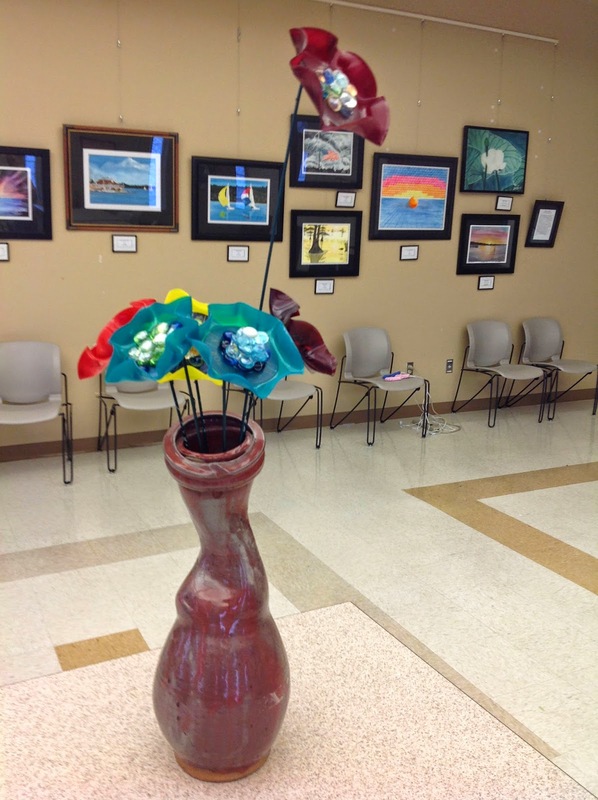 There are always great programs going on at the Pearl Public Library. 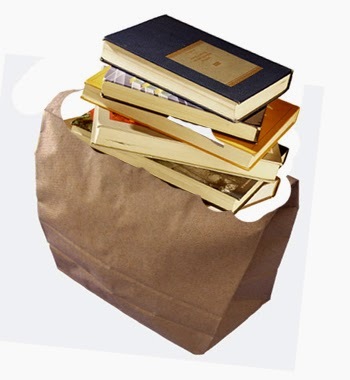 Don't forget the bag of books for $1 book sale going on right now. All the books you can fit into a bag. 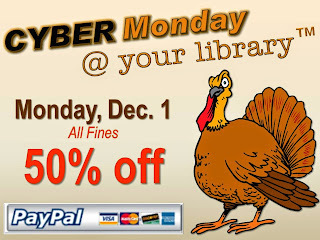 The proceeds go to benefit the Friends of the Pearl Library. CHAPTER 1 BOOK CLUB FILLS UP ON A GREAT READ IN PEARL! Author Fannie Flagg, of Fried Green Tomatoes at the Whistle Stop Cafe, Can't Wait to Get to Heaven and I Still Dream About You fame, has done it again. 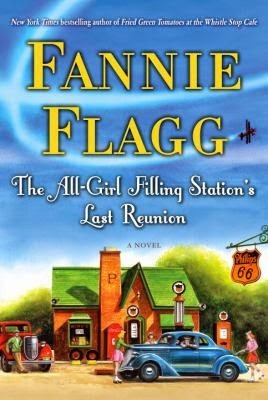 Flagg's latest book, The All-Girl Filling Station's Last Reunion, is a hoot, and Cecelia's pick for the Chapter 1 Book Club meeting Thurs. Nov. 13 at 6 p.m. at the Pearl Public Library. Sookie Poole of Point Clear, Alabama has just embarked upon an empty nest, and is set to enjoy life with her husband Earle. She has just married off the last of her daughters and is looking to relax and perhaps even travel. 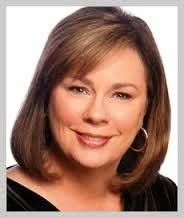 But, then there's her mother to deal with; Lenore Simmons Krackenberry. Even at 88, Ms. Lenore is beautiful and loads of fun to everyone, except Sookie who pretty much thinks her mother is overbearing. As it is with life's crazy twists and turns, Sookie finds out that Ms Lenore is not even her biological mother. That's a great thing to be hit with when you are Sookie's age, or what she thought was her age. Sookie finds out she's a year older! She doesn't get the opportunity to gracefully segue into 60 from 59. Nope, she's slammed right into the big 6-0! Sookie's real mother is Fritzi Willinka Jurdabralinski of Pulaski, Wisconsin, oldest child of Polish parents! Fritzi's father owns a service station but falls ill. Her brother goes off to war. That leaves Fritzi and her sisters to run the service station. With all girls running the shop, it became quite popular. Fritzi later joins a flying circus. Then she enters the volunteer Women's Airforce Service Pilots (WASP) of World War II. Naturally, all this news leaves poor Sookie in identity crisis mode! For 59 years she was a full blown all-southern girl. Now, Sookie learns that she has deep Polish roots. You just know the book is a fun read! So, read the book and stop by to discuss Sookie's crazy life journey! No reservation needed and you don't have to be a member to participate. And, as always, there will be light refreshments and door prizes. A BAG OF BOOKS FOR A BUCK AT THE PEARL LIBRARY! A bag of books for a buck! Say that five times really fast. Juuuuuuust kidding! But, this is no joke. For one dollar, you can buy a whole bag of book sale goodies at the Pearl Public Library! This sweet, bagalicious , all-you-can-fit-into-one-bag, $1 book buffet will last as long as there are books for sale said Sara, the circulation supervisor. "That should be for at least two weeks." WOW! Don't miss out on this opportunity to bag you some real great deals. Remember, they make wonderful gifts too! And, since all proceeds go to benefit the Friends of the Pearl Library, it can be your way of donating to a wonderful cause!!! You simply cannot beat that! So, come on by the Pearl Library. The book sale items are near the circulation desk! 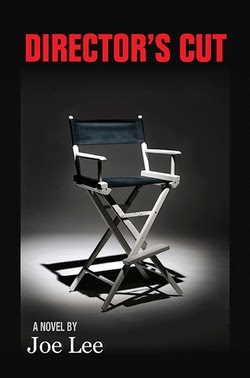 PEARL LIBRARY PRESENTS JOE LEE'S "DIRECTOR'S CUT"! The Pearl Public Library presents popular Mississippi author Joe Lee as the Brown Bag program guest speaker on Fri., Oct. 24 at 12-noon. He will be discussing his latest work, Director’s Cut, (2014) the fifth of the critically acclaimed Oakdale suspense series. It is his seventh novel. A book signing will follow. In Director’s Cut, Tripp Kelly is a laid back film professor at the University in Oakdale. He has everything. He’s popular among the student and faculty body. He’s newly and happily married to a former student named Dana. He loves his work which includes spearheading an annual, well attended independent film festival. He’s just a happy guy, and couldn’t be happier. He’s also a serial killer! THAT got your attention didn't it!? 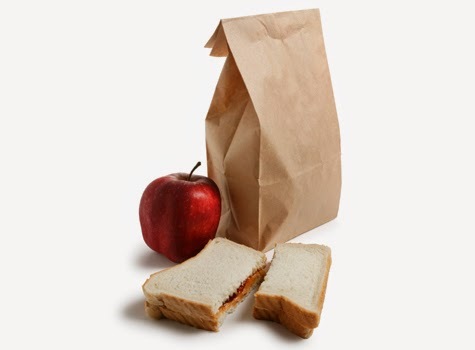 See, you do not want to miss this Brown Bag special. No reservations needed. 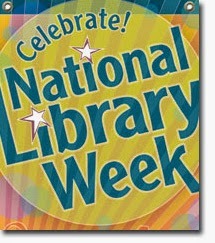 The program is free; desserts and drinks are supplied by the Friends of the Pearl Library! CHAPTER 1 BOOK CLUB GETS DOWNRIGHT "DEVIOUS"! fame, really go there? Oh, yes she did! She picked a twisted one this time! One that's just right for the month of Halloween! Devious is the title. Need anymore be said? Of course! It's a wicked crime. A heinous crime. For crying out loud, in the name of all things Holy, some crazed degenerate has gone and killed a nun? Is that enough said? I didn't think so! The crime scene: St. Marguerite's Cathedral in New Orleans. In a yellowed, bridal gown is how they found murdered Sister Camille, her body covered with an altar cloth. Even local, veteran detectives are freaked out about it! Naturally, Valerie Houston (Val), Camille's sister, was just torn up by her sister's death. What made things worse is that she had pleaded with Camille to leave St. Marguerite, but Camille didn't always make the best choices. In fact, Camille ran to join the convent after falling in love with Slade,Val's soon-to-be ex-husband. Like any distraught family member, Val, just didn't think the police were doing enough so she begins to investigate herself! And, here comes Slade trying to make some brownie points by helping. He is still into Val and wants to put their marriage back together. As Val gets deeper into the investigation, she learns things are not as they seem. A normal, reverent convent is not what St. Marguerite is turning out to be, not by a loooooooooong shot! Father Frank O' Toole and Mother Superior are mighty suspicious themselves. Then Val learns that Camille had a hidden life. But, we all know things don't stay hidden forever. Somebody knew about Camille's past and uh, Val's too! Now, Val has got to find this devious killer that is out to cleanse St. Marguerite's of all its sins. Plus, Val may be next on the list! WOW! Don't you want to know more?!?! You have got to read this book! Hey, it's one of famed author Lisa Jackson's creations! You just know it's really good! Jackson has written more than 85 novels, and 30 of them have been best sellers! 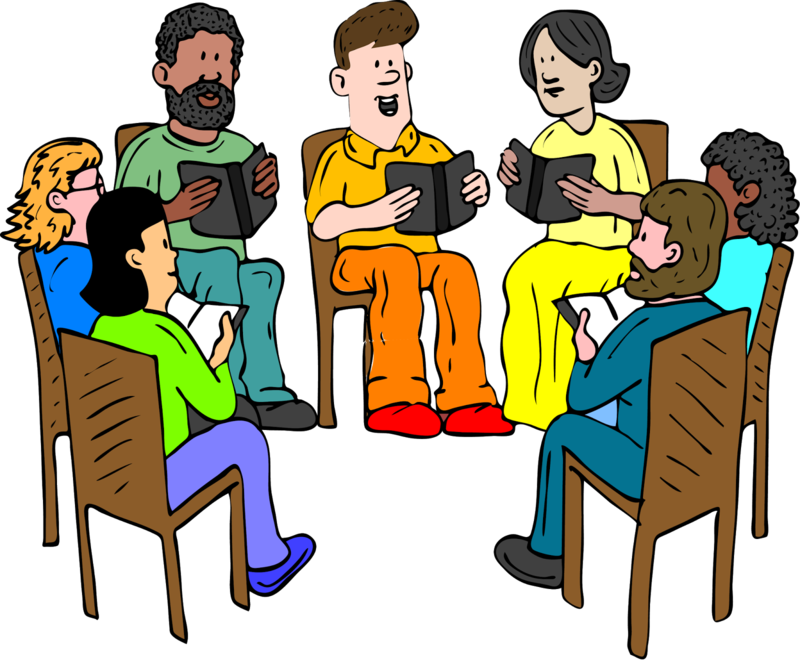 Come on by the Chapter 1 Book Club meeting, Thurs. Oct. 9 at 6 p.m. No reservations needed, and as always, light refreshments and door prizes included! LOOK AT THE SIMPLY CRAFTERS GO IN PEARL! 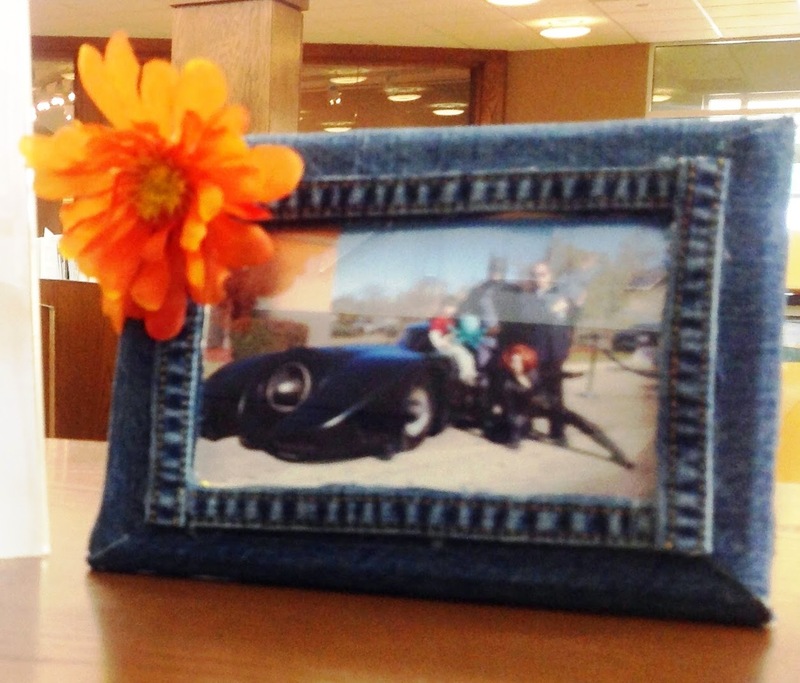 Denim photo frames with bright flower embellishments, in the making, at the Pearl Public Library! 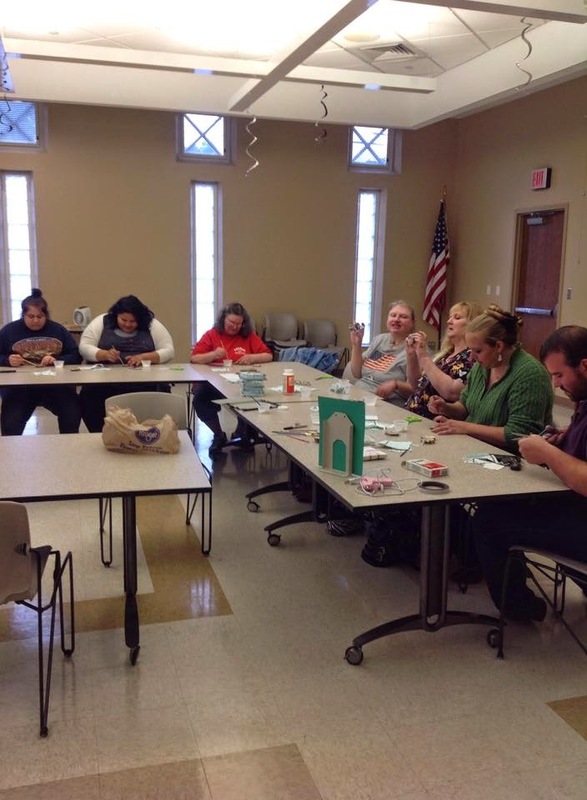 Eleanor's September's Simply Crafts' night was a massive success! The group enjoyed every minute of this fun time. They couldn't wait to show off their creations . Eleanor was so excited about the group's enthusiasm she couldn't wait to show them what's coming up in October. You really don't want to miss out on such a great craft night! 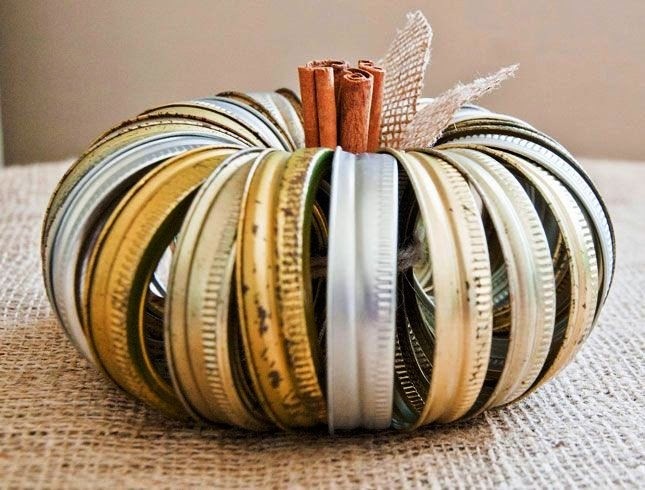 The season is just right for this impressive Mason Jar Lid Pumpkin delight coming Tues. Oct. 14 at 6 p.m.! Remember, Simply Crafts is every second Tuesday of the month at 6 p.m. No reservations required and all materials are supplied! Come on and join in the fun. Eleanor will be so happy to see you! COMING UP! FANTASTIC SIMPLY CRAFTS IN PEARL! Listen up! You have got to mark your calendars! Eleanor is on craft making FIIIIIIIIIIUHHHH! Uh-huh, she is red hot, blazing a nifty lineup of creative crafts all the way through December at the Pearl Public Library! Starting with a really cute Denim Photo Frame garnished with a pretty, bright flower for September's Simply Crafts on Tues. Sept. 9 at 6 p.m. That is followed by an awesome - Southern Living type craft - Mason Jar Lid Pumpkin on Tues. Oct. 14 at 6 p.m. Great stuff! Hey, who's feeling hootish?!? 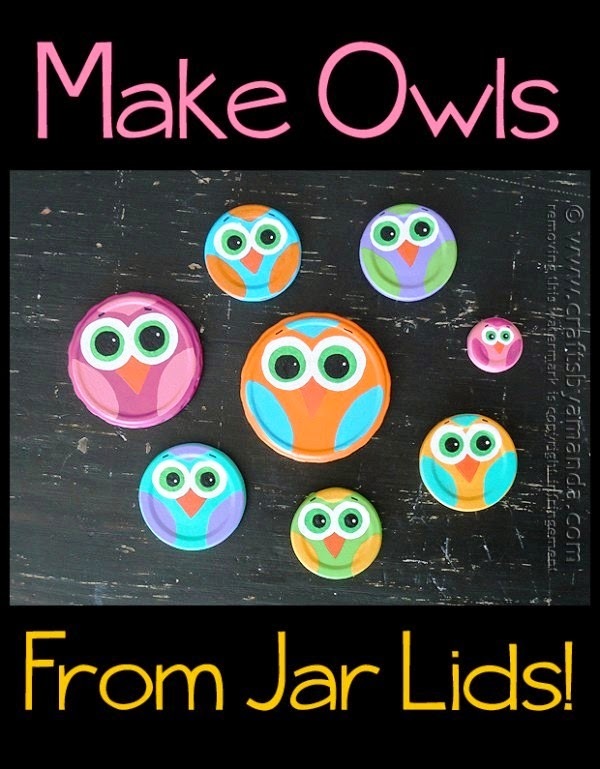 The jar lids make another stellar appearance as festive, colorful Jar Lid Owls on Tues. Nov. 11 at 6 p.m..
HO, HO, HO, Here comes Santa Claus. He's got quite a sweet, holiday smell. What is that? No, not cookies. Not this time. It's CINNAMON! 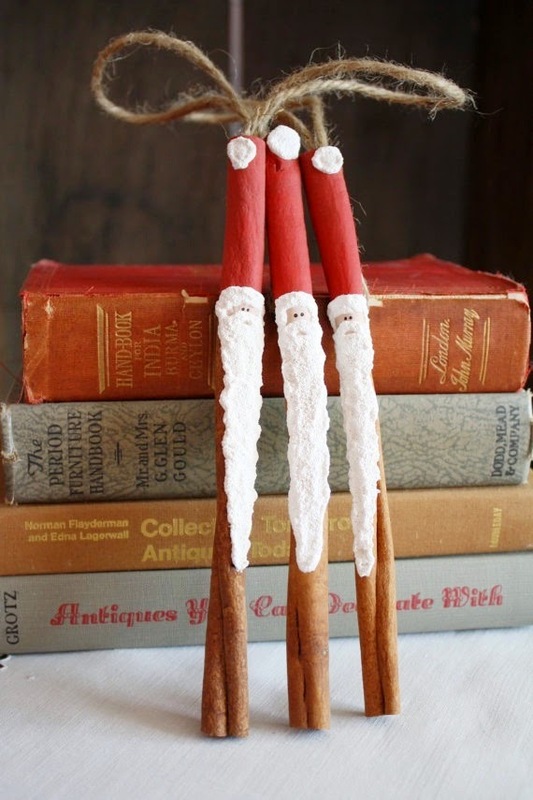 You don't want to miss crafting Santa Cinnamon Sticks! No way! That's Tues. Dec. 9 at 6 p.m. 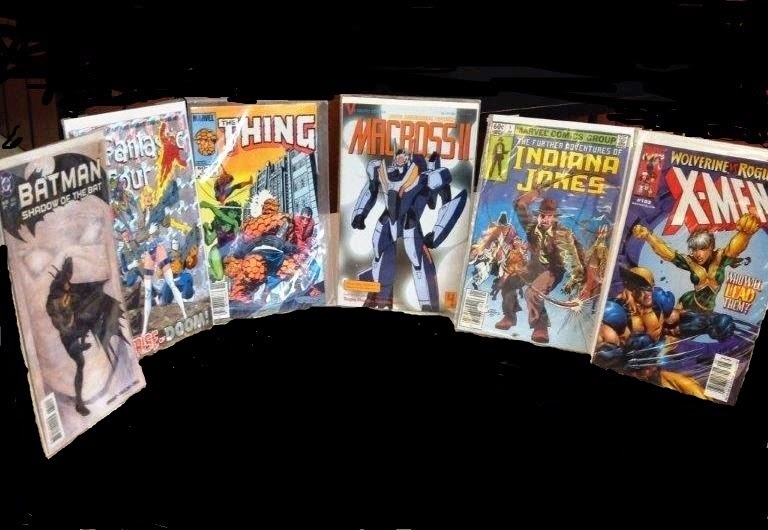 It would be terrible to miss out on any one of these. Remember, Simply Crafts is every second Tuesday of the month at 6 p.m. No reservations needed and all materials are supplied. 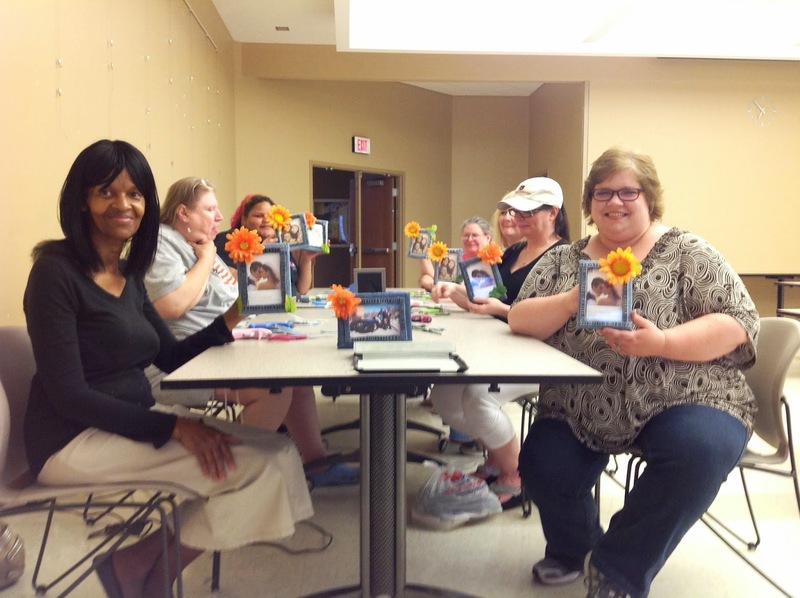 CHAPTER 1 BOOK CLUB SOARS IN SEPTEMBER! Cecelia has picked another good title for her book clubbers! 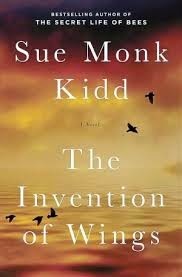 The Chapter 1 Book Club, at the Pearl Public Library, will discuss author Sue Monk Kidd's most recent book, The Invention of Wings, a New York Times bestseller. 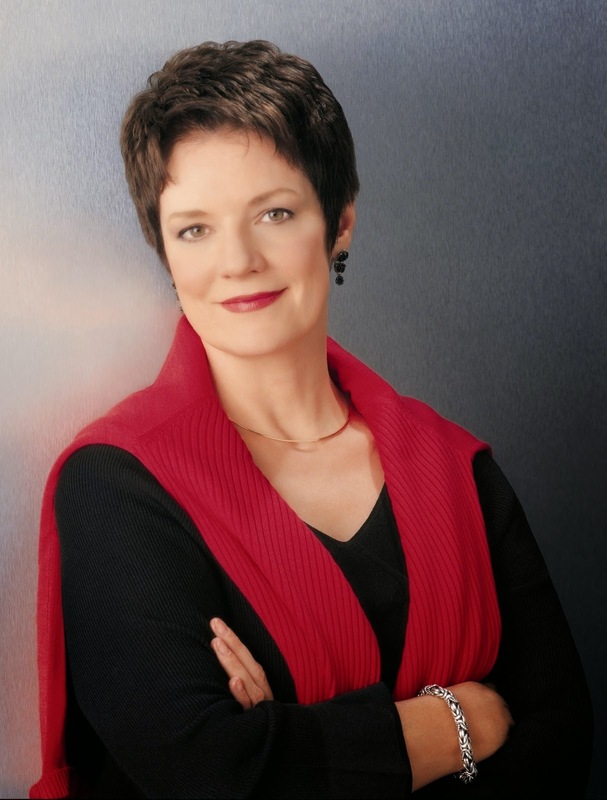 Kidd is also the author of The Secret Life of Bees, another bestseller and her first novel. The Invention of Wings was inspired by the true, 1830s story of southern, abolitionist sisters, Sarah and Angelina Grimke. The two were exiled from their home city of Charleston, S.C. for speaking against slavery and standing for liberty and equality. Kidd discovered that at the age of 11, Sarah's parents gave her the "human present" of 10-year-old slave girl Hetty as her handmaid. Sarah totally rebelled by teaching Hetty to read. It resulted in Hetty being punished with a beating so severe that it killed her. Kidd wanted her novel to bring Hetty back to life, and that's exactly what she did in this riveting story. Published January of this year, The Invention of Wings, tells a lively story revolving around fictional Sarah and Hetty in a story of what might have been. Kidd begins the fictitious account with both girls cast in life circumstances they both despised, giving Hetty her own life of struggle and change. The story, which is immensely alive and believable, unfolds throughout years of the girls' lives. The Invention of Wings remained on the bestsellers' list for over five months. It has been translated into 20 languages, was chosen for Oprah's Book Club and there are plans to turn the book into a film. Don't miss out on this sure-to-be stimulating discussion of The Invention of Wings. The Chapter 1 Book Club meeting is Thurs. Sept. 11 at 6 p.m. Don't miss out! No reservations needed. You don't even have to be a member to stop on by. Light refreshments and door prizes are always included. PEARL'S CHAPTER 1 BOOK CLUB MEETING RESCHEDULED! 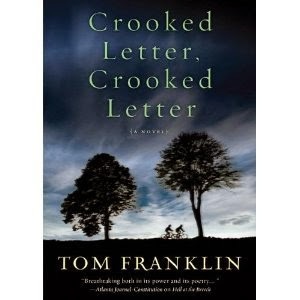 The Chapter 1 Book Club discussion of Tom Franklin's Crooked Letter Crooked, Crooked Letter, scheduled for tonight, Thurs. Aug. 14 at 6 p.m., has been moved to next Tues. Aug. 19 at 6 p.m. The book club will resume it's normal Thursday night schedule in September. The Chapter 1 Book Club at the Pearl Public Library will feature Franklin's, Crooked Letter Crooked Letter Tues. Aug. 19 at 6 p.m.
BACK TO COMPUTER BASICS AT THE PEARL LIBRARY! The Pearl Public Library is taking a break from teaching Facebook, Excel and PowerPoint this month. Yes, it's back to the basics, the real basics! There will be three classes total starting with Introduction to the Internet today, Thurs. Aug. 7 at 4 p.m. Following will be Introduction to Email on Thurs. Aug. 14 at 4 p.m. and Introduction to Microsoft Word on Thurs. Aug. 21 at 4 p.m.
Now is the time to do what you have been putting off for a long time. Learning how to use the computer is easy and fun! And, it opens up a whole new world! So, come on by. It's free! 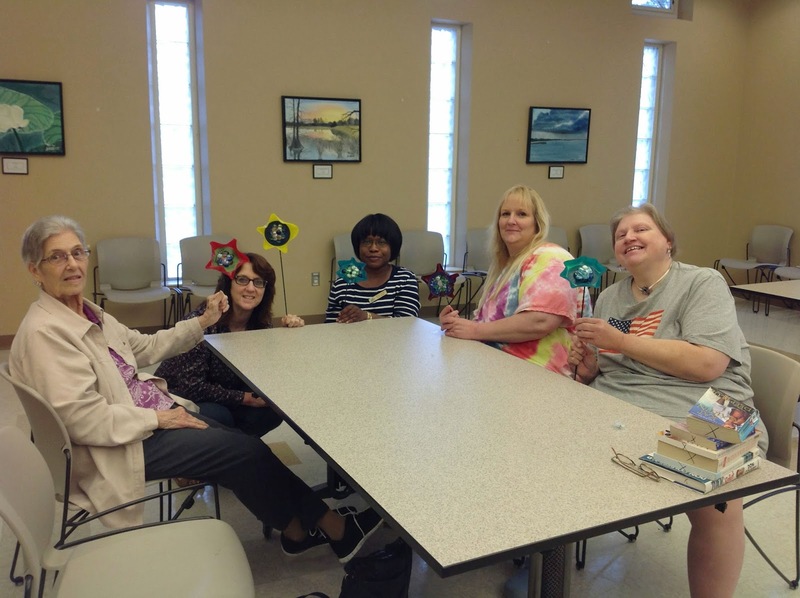 ADULT SUMMER READING A "SHOUTIN'" GOOD TIME AT THE PEARL LIBRARY! The Adult Summer Reading Program is still sizzling at the Pearl Public Library as the celebration of Literary Elements (ASRP theme) continues! Come, join the Chapter 1 Book Club gathering on Thurs. 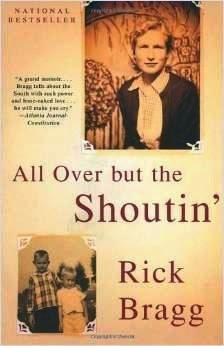 July 10 at 6 p.m. to discuss the life of writer/ journalist Rick Bragg as written in his autobiography All Over but the Shoutin'. 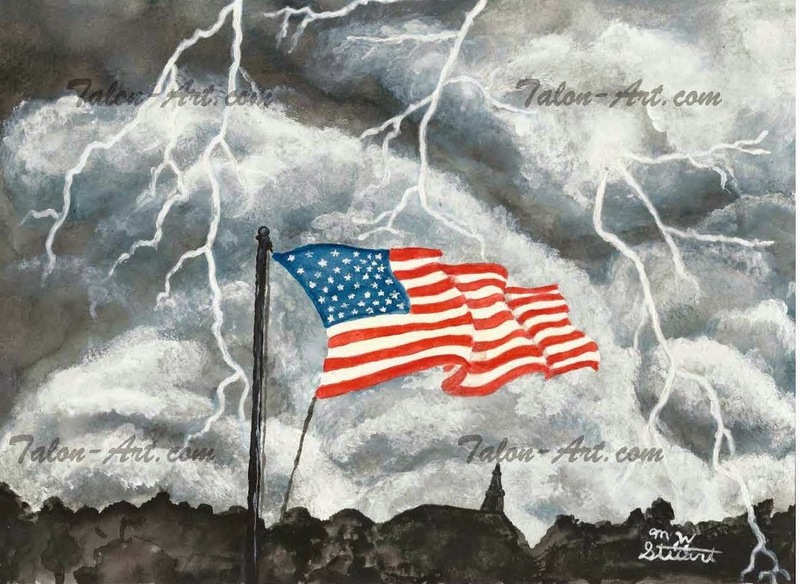 Poverty ridden, Bragg grew up in Alabama with an unpromising future ahead of him. Somehow Bragg defied the odds and landed at The New York Times where he won a Pulitzer Prize. In this hold-nothing-back account, Bragg tells about the horrors of living with an alcoholic father, and shares his saintly mother's inspiring suffering and bravery in a moving story filled with brutal honesty. You don't want to miss this Chapter 1 Book Club meeting! No reservations required, and you don't have to be a member to attend. Just stop on by. You know it's ALWAYS good at the Pearl Public Library! 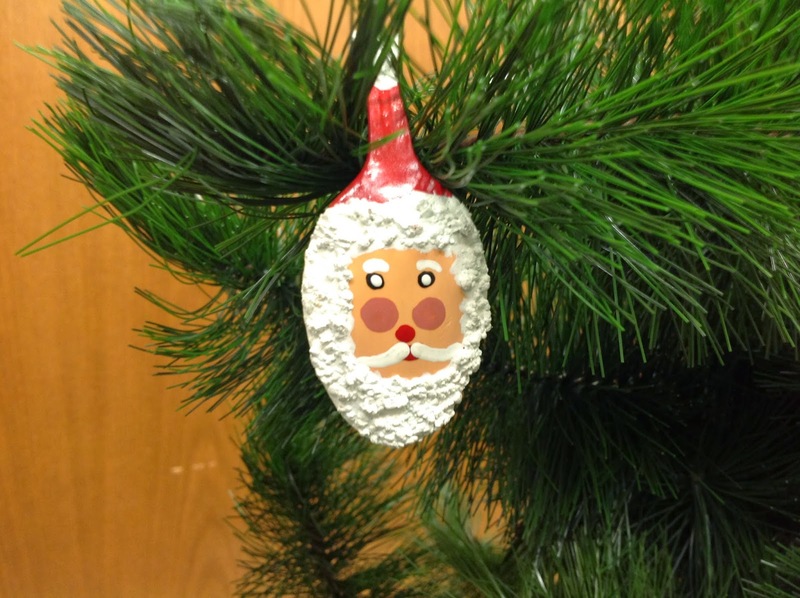 A CRAFTY CHRISTMAS IN JULY AT THE PEARL PUBLIC LIBRARY! 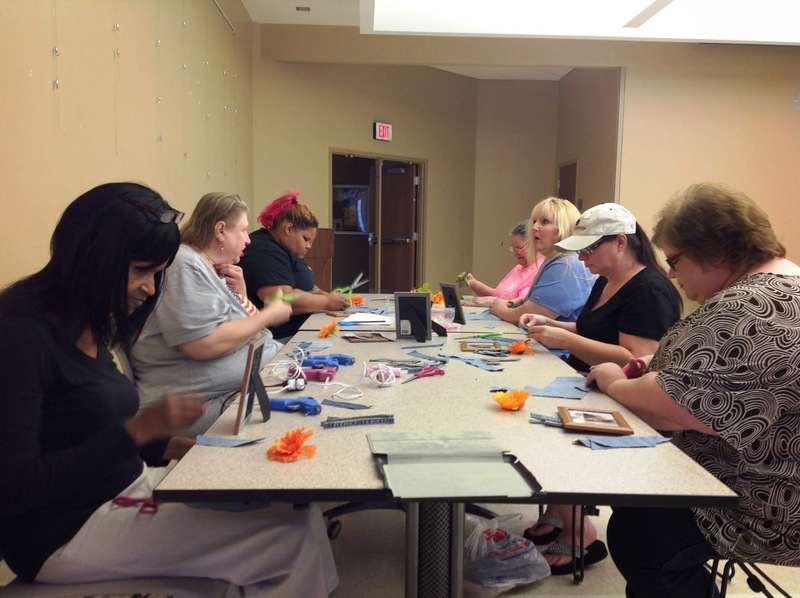 The July Simply Crafts program is sure to bring some Christmas holiday cheer! It's never to soon for that is it?! NO WAY! Hey, who doesn't love Santa! This little jolly treasure is a hand painted spoon. Can you believe it?! DecoArt Snow Tex is used for the beard to give it that wonderful stucco effect! Don't miss out! Come on and join Eleanor and the gang Tues. July 8 at 6 p.m. No reservations needed and materials are supplied! 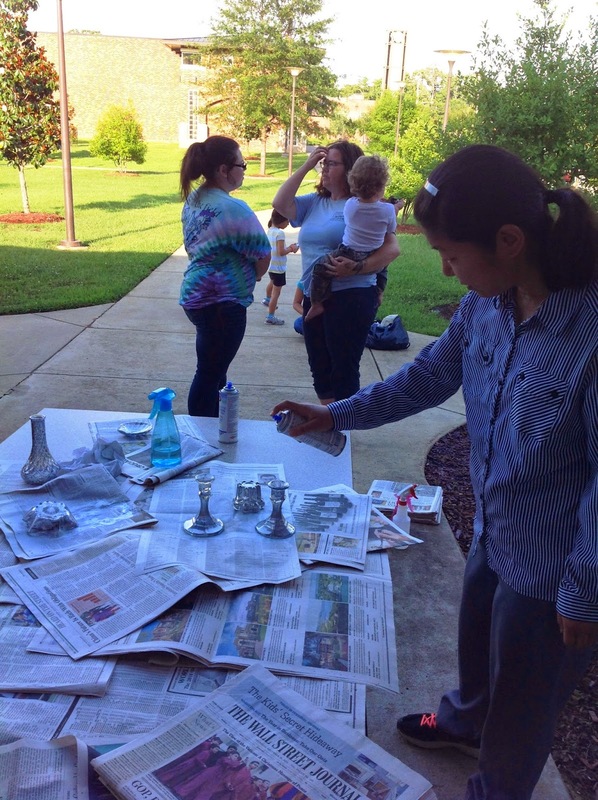 CRAFT AL FRESCO AT THE PEARL PUBLIC LIBRARY! Oooooh, yeah, last night's Simply Crafts' group had to be moved outside. PRONTO! Uh, huh... Yeah, apparently no matter how big the room is - the Pearl Library's meeting room is preeeeeeetty ginormous - spray painting indoors is just not a uh..cough, cough, excuse me... good idea. OK! Eleanor learned that pretty darn quickly, and took it outdoors. 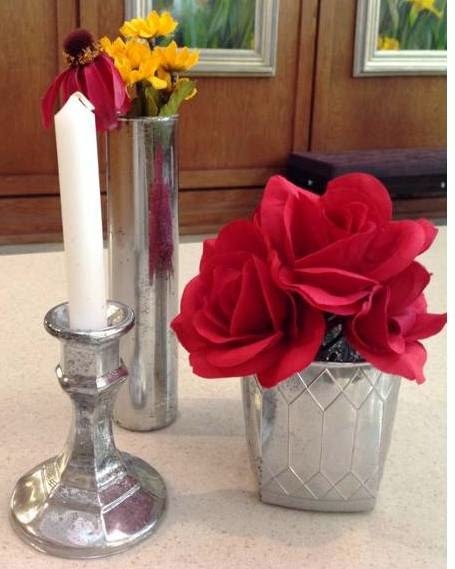 Everyone had a great time turning simple glass into beautiful Mercury Glass (also called Silvered Glass) which sports that fabulous antique silver finish. Remember that Simply Crafts meets the second Tuesday of every month at 6 p.m. No reservations required and materials are supplied. Eleanor is working on a great craft for Tues. July 8! Don't miss it!....... It's beginning to look a lot like Christmas..la, dee, da, da, daaah... You're jolly curious aren't you?!!!.... Hey, keep tuned in right here to find out more! 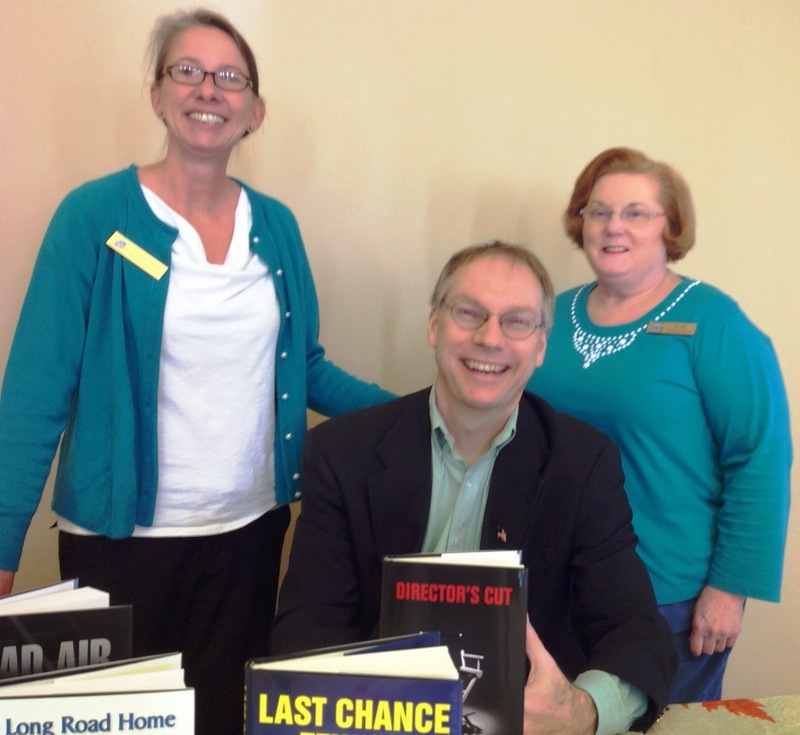 ELMORE LEONARD, A BOOK CLUB DELIGHT AT THE PEARL LIBRARY! 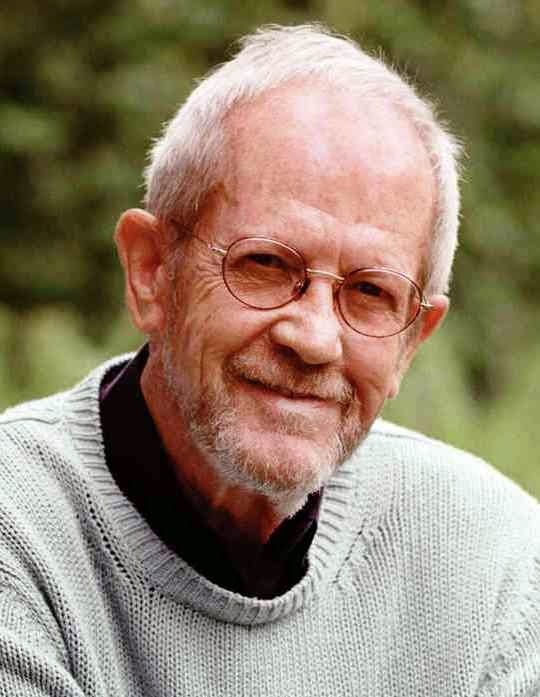 It's all about famed author Elmore Leonard for the Pearl Library's Chapter 1 Book Club's Thurs. 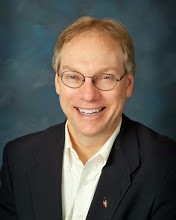 May 8 meeting at 6 p.m. It's not one particular title. It's any book by Elmore Leonard said Pearl Reference Librarian Cecelia, the group's leader, who is reading Forty Lashes Less One, a Western by Leonard. Elmore John Leonard, Jr. was born in New Orleans in Oct. 11, 1925. He died less than a year ago, Aug. 20, 2013 in Detroit where his family had lived for years. He was 87. Leonard's father Elmore John Leonard Sr. was a site locator for General Motors so the family moved around a lot finally settling in Detroit. Leonard started out writing Westerns but went on to specialize in crime fiction and suspense thrillers. Many of his books and stories have been made into movies. 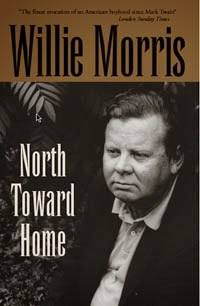 He was not only a novelist but a successful screenwriter as well. His writing style has been described as "gritty realism" and "strong dialogue." 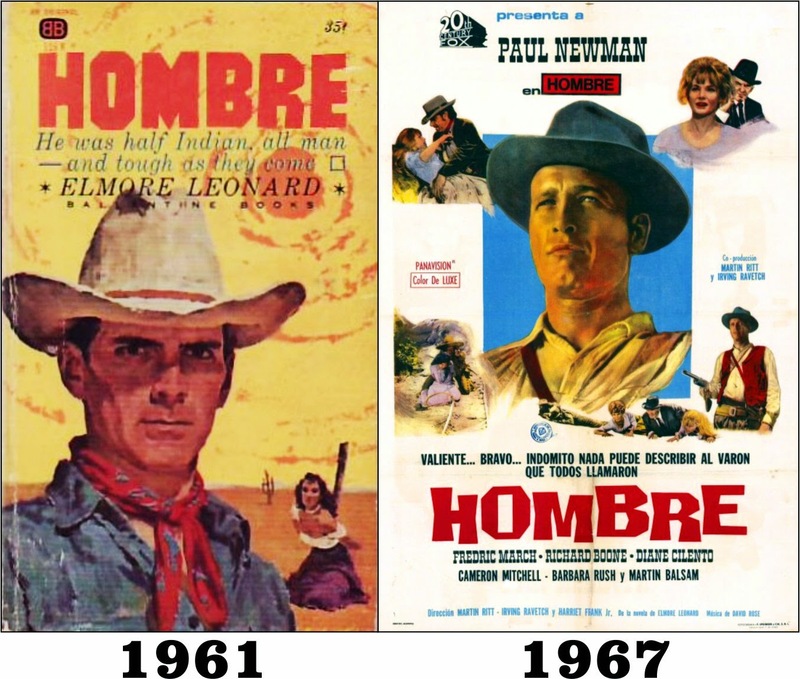 Some of his popular books include: Get Shorty, SWAG, Three -Ten to Yuma, Rum Punch, Hombre, Out of Site, 52 Pickup, Kill Shot, Split Images and La Brava. Please do come and enjoy the discussion, light refreshments and door prizes. No reservation is needed, and you don't have to join as an official member. Just come on by! 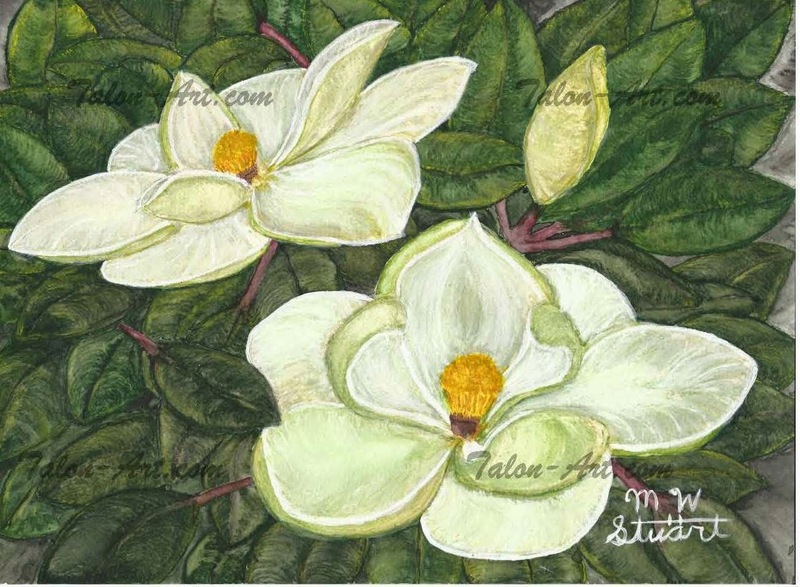 YOU CAN ALMOST HEAR THE FLOWERS SING! 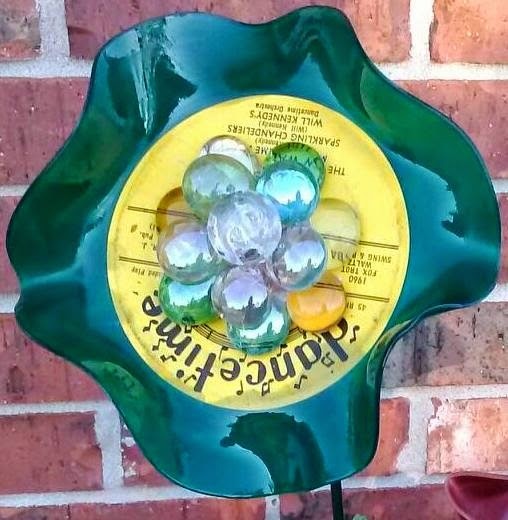 Vinyl Record Flowers is what they are called. 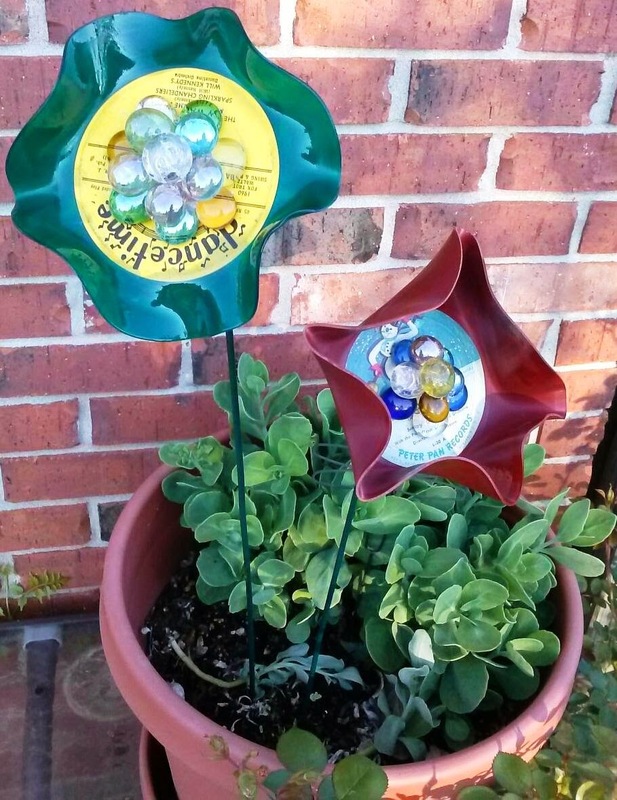 How about these to brighten up any deck, porch or garden?! Who found this simply, wonderful craft idea? Need you really ask? 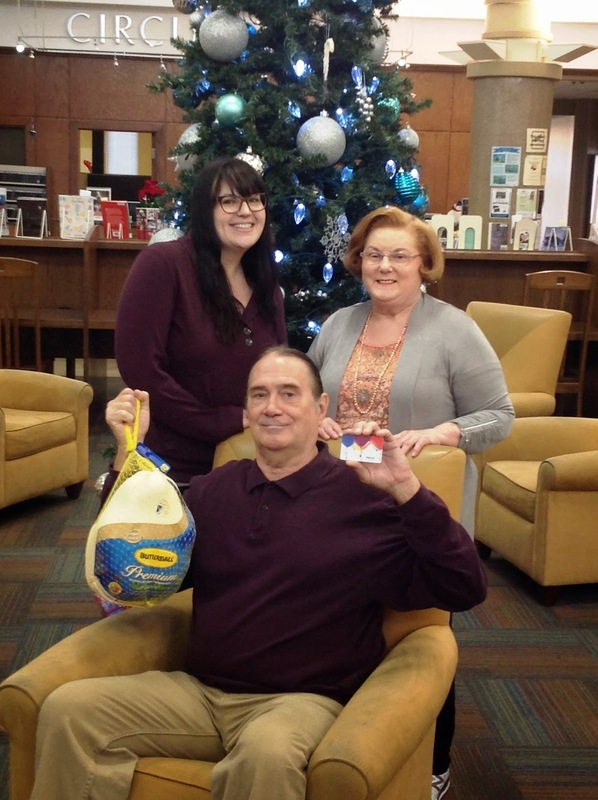 Eleanor, Pearl Library Reference Supervisor and queen of all things Simply Crafts! It's easy she said. All it really takes are children's albums, decorative, glass pebbles or stones and garden stakes. Wanna learn how to make them? Then do not miss the Pearl Library's monthly Simply Crafts night on Tues. May 13 at 6 p.m. Eleanor will make sure everyone has a really good time! Remember, no reservations needed and all materials are furnished. A BEAUTIFUL, MAGNETIC EVENING IN PEARL! Simply Crafts night, Tues. Apr. 8, at the Pearl Public Library, featuring Wood Slice Bird Magnets, was a huge success as you see participants hard at it in the photo! Speaking of hard at it, Eleanor, the group's leader, is already working on ideas for next month's project. We'll be letting you know about that real soon! 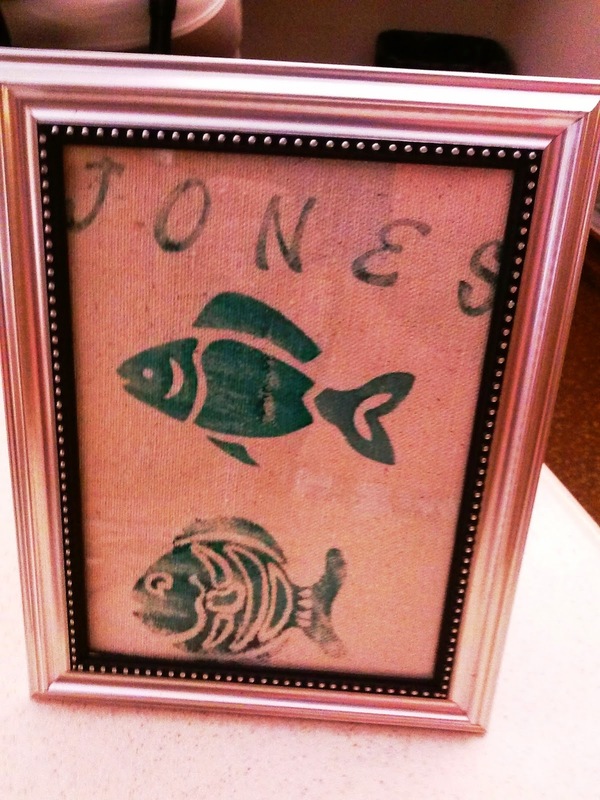 Simply Crafts is fun and free. All materials furnished. It's the second Tuesday of every month at 6 p.m. Tell your friends and family. Bring them all! CRANKING UP APRIL AT THE PEARL LIBRARY! TUES. APR. 8 AT 6 p.m. DOOR PRIZES AND LIGHT REFRESHMENTS! EASTER BUNNY DELIVERS BIG IN PEARL! OMG! IT'S HOPPIN' EASTER MADNESS! What on earth is going on at the Pearl Public Library!!! Do you know what Eleanor just told me? This is huge. This is reeeeeeeeeeeeeeeeeally HUUUUUGE! Eggs. Eggs. Eggs. And more Easter Eggs! Yep! The Easter Bunny just thought it would be a good idea to have an Easter Egg hunt all April-long! So, he delivered eggs and tons of candy to Eleanor! This is how the hunt works. Find an Easter Egg in the FICTION or NONFICTION book sections of the library (Some patrons already have!). Open it up, and you'll find a note inside instructing you to take the egg to the Reference Desk to redeem your PRRRRRRRIZE! But, that's not all. That wonderful, Pearl Library Loving Easter Bunny left a special egg that will be added to the hunt during National Library Week, April 14 - 18! Find the egg and win a very, very special prize! Don't miss out on this EGGSTRAVAGANZA! Come on to the Pearl Library and join in the fun. You'll be hoppin' glad you did! Crochet And Denim Put Together Like Flowers and Spring! 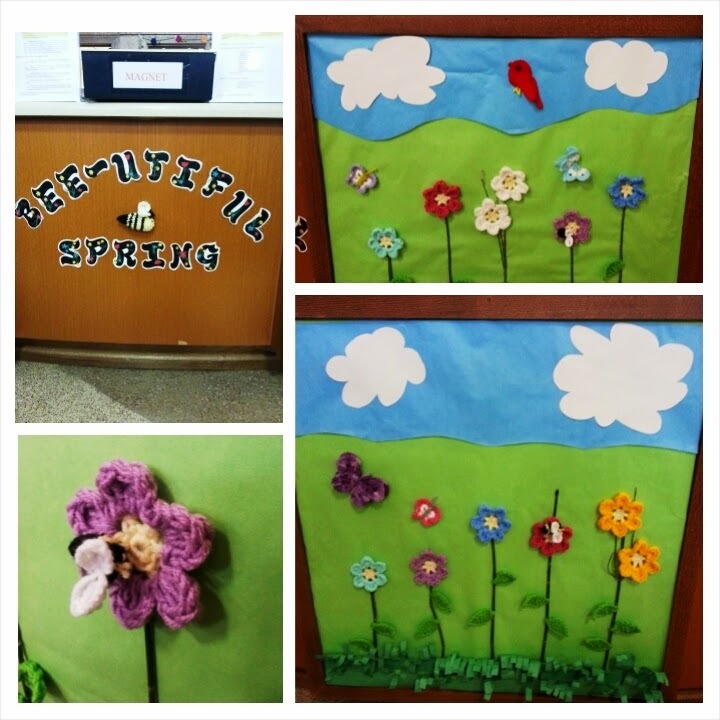 Spring has sprung at the Pearl Public Library in a most creative way! So, do not tell the circulation staff that Spring is not made of crochet because guess what?! It sure is! Mrs. Rachel got her fingers aworkin' and produced all the flowers, bees and the precious, red bird! WOW! That's a true gift! That lady can crochet like nobody's beeswax! Sara and Carolyn (who did all the lettering), along with the rest of the circulation staff, worked hard to get it all up! UHHH-HMMMMM!!!! Not to be outdone, Eleanor, from the Reference Dept., pulled out leftover denim from her Giving Tree Simply Crafts program and made all of THIS (above and below)!. Lettering, flowers, sun and grass border, all denim! Can you believe it! GREAT GOLLY, MISS MOLLY these folks are sure talented! Come by the library and see these bright, festive decorations! Denim Spring Desk by Eleanor!